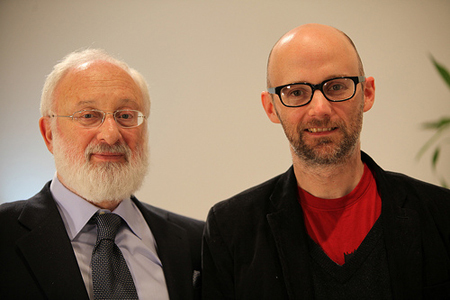 Moby, musician, singer-songwriter and DJ, talks with Dr. Michael Laitman about human interactions and music. Moby: Music often times is the embodiment of spirit, because you can’t touch spirit. And it drives us, as humans, crazy because we like things we can touch. I like being able to say “chair” and “shoe” and “fake apple.” There’s comfort in identifying and labeling, but the universe cannot be identified; the universe cannot be labeled. Michael Laitman: You’re right in that music, of all human engagements, of all that we build and create in our world, music is the most spiritual. It is the most sublime. It’s something really existing not even in sounds because there are no sounds. There’s a kind of special harmony to it that exists in nature beyond the sounds. When we perceive a little bit of that harmony and clothe it in notes and kind of drink a tiny sip of it, it’s truly beyond and above any corporeal expression, beyond frequencies. Kabbalah explains where these forces come from, how I perceive them, why I understand them the way I do, why through all kinds of means and pretty limited means I create those sounds that I hear; not in my ear. But before we can visualize music within us, there is a kind of program, a harmony that is depicted in our brain regardless of our hearing, regardless of notes, of sounds. And we process it down to notes, down to certain sounds, in a certain order that is bounded by time and movement, and we turn it into music. But before that, it’s something that exists on a degree that is above us.